The VB220 PROBE is the perfect choice in any network where digital video is carried across an IP-based infrastructure. 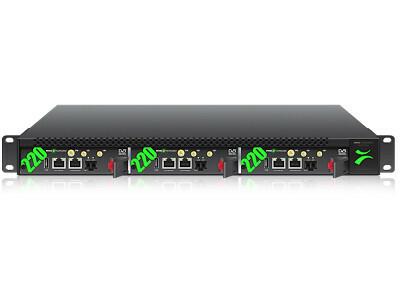 Built specifically to high-end industry needs, this network service tool is ideal for both pure IP networks and hybrid networks with IP transport cores such as in digital cable and terrestrial networks. The VB220 probe hardware is custom designed and built to telco-grade standards for maximum reliability and minimum maintenance. Each VB220 blade consumes less than 12W of power. This drastically cuts on power consumption and air conditioning needs in installations. The VB220 can be paired with a full set of interface blades to cover signal formats such as DVB-T/T2, DVB-S/S2, DVB-C/C2, QAM-B, 8VSB and ASI. Monitor OTT/ABR streams at master play-out or at CDN origin server in all common streaming formats using the OTT option. Streaming formats supported currently include Microsoft Smoothstream™, Apple HLS™, Adobe HDS™, MPEG-DASH and basic RTMP. A single VB220 blade is furthermore capable of monitoring up to 260 IP multicasts as found in FTTH IPTV systems. 3 x VB220 blades can be placed in one 19" 1RU chassis, giving a total of 780 streams monitored in a small form factor. The VB220 is ideally suited for network core and region use. This is an invaluable helpmate for any network engineer attempting multicast detection on multiple VLANs or in the process of IGMP tracking. Fault finding in complex IP networks just got a lot easier. The monitoring of critical parameters such as loss distance measurements and detailed jitter values will give operators invaluable and precise feedback of network performance. With the patented MEDIAWINDOW™ historical data can be easily accessed for meaningful visualisation of media flow in IP networks. Whether establishing or modifying service settings on complex routers and switches, the VB220 facilitates the whole process. The power of confidence monitoring is further enhanced by continuous monitoring and alarming for vital parameters like bandwidth overflow/underflow, RTP errors and signal loss. Based on a highly sophisticated threshold template system alarm granularity can be set to reflect actual status, irrelevant alarms being effectively masked. The unique FSM™ framework also allows checking and continuous monitoring of middleware and network services vital to customer QoE. The VB220 may be used with optional demodulator interfaces, resulting in a very compact monitoring solution particularly suited for systems that use IP distribution to regional nodes. The VB220 monitors IP, ASI and optional demodulator inputs simultaneously, and the transport stream and service compare mechanism makes it easy to validate correct local insertion at regional head-ends. The VB220 can be expanded with the ETR290 option for full video monitoring and analysis functionality according to TS 101 290 as used in head-end and studio environments. SNMP trapping and XML export enable the IP-Probes to be implemented in any NMS system with alarm generation; either directly from the probes themselves, or via the VBC server for advanced alarm correlation and filtering. Each VB220 contains the Eii (External Integration Interface) API for seamless and easy integration into any 3rd party system. Each IP-Probe runs an HTTP server with the client as a web browser, so no need to install custom software on computers needing access to the measurement data. The HTTP traffic is compressed between the probe and the client web browser to allow successful operation across limited bandwidth management networks.